Ekiti State Governor, Ayodele Fayose, has replied Ali Modu Sheriff, the recently reinstated National Chairman of the Peoples Democratic Party, PDP. 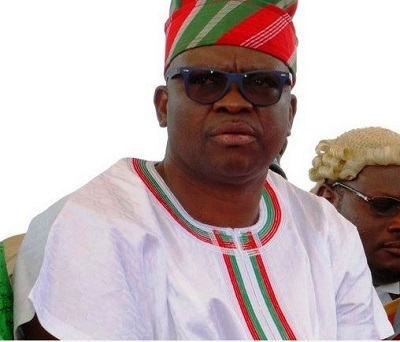 Fayose replied Sheriff’s alleged comment on plans to kick Governors Fayose and Nyesom Wike out of the opposition party. “Whether he is being backed by whatever forces, be it external or internal, good luck to him. Let everybody in PDP calm down, there is salvation ahead of us,” he said. Continuing, Fayose said:“I’m aware that some people are apprehensive of 2018 but I want to say it here that they should worry not. What I know that will happen tomorrow is that I will get to greater heights. “There are three major important factors in elections, the people is number one, followed by the party and the candidate. You can have a party and candidate, if you don’t have the people, you will fail because the power of the people is greater than the power of those of us in power. “Here in Ekiti, we have the people. I am saying it here that we are under the leadership of the Ahmed Makarfi led Caretaker Committee. When we got the judgement at the lower court, affirming the Caretaker Committee, Sheriff was still parading himself as the chairman,” he said. Ali Modu Sheriff was reinstated as the PDP caretaker committee chairman by an Appeal Court judgement which sat in Port Harcourt on Friday, February 17, 2017.